A decision many people agonise over when building is what materials to use on the outside of their home. The type of materials you use and colours will set your street appeal – the first impression your house makes. Brick or render are two of the most common materials but there are many more worth considering to add interest, design edge or personality to your home. I recently visited Denman Prospect, a privately-developed suburb of Canberra, where I toured all the display homes. The interesting mix of cladding materials inspired this article on 10 external building materials to consider! 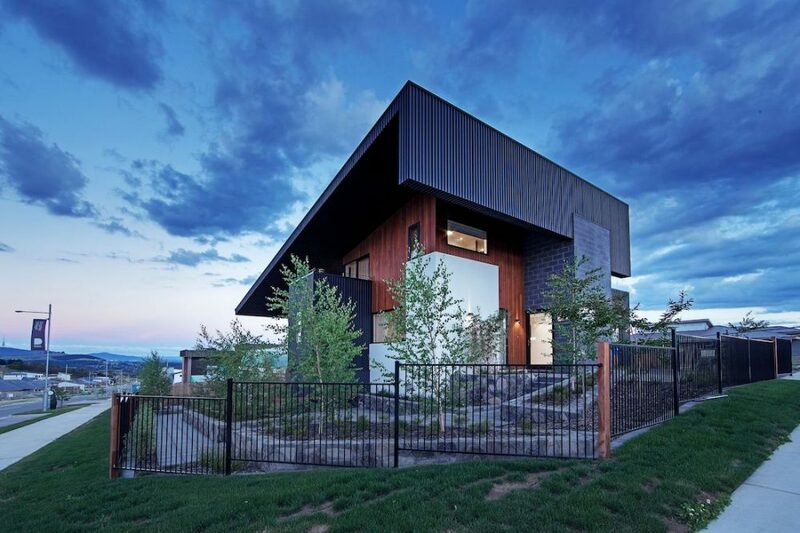 My absolute favourite material to use on the exterior of a house at the moment is contemporary metal screening, just like the metal screening used on the Kolak Living house above. The dramatic vertical lines, especially when used over a double storey facade, create such a bold design statement. Yes, this material is more pricey but you’ll see a little goes a long way. Inject character and add a beautiful design feature to your home by incorporating recycled or reclaimed brick. Depending on the style of your house, recycled bricks can either be used to blend in with other materials or to contrast. Just take a look at how Classic Constructions used it as a feature around the garage and into the entry to create a modern facade. Many people also love to use recycled brick for sustainability reasons, helping to reduce the impact of construction on the environment. Quite possibly the material that’s gaining the greatest popularity right now is weatherboard cladding. Suiting a range of styles, from Hamptons to contemporary, the panelled look is making a big appearance right now. You could paint it white for those coastal vibes, black for a modern edge, or even embrace a colour such as deep navy. 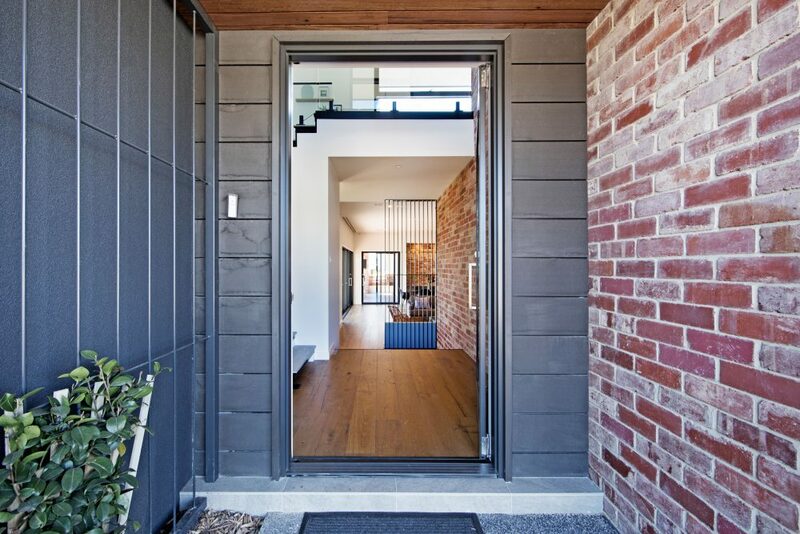 Love the look of bricks but can’t find the ‘right’ brick to bring your design ideas to life? The struggle is real! Perhaps the solution is a brick tile instead? Available in a similar shape and texture as solid bricks, there are many more colour options available in brick tiles. 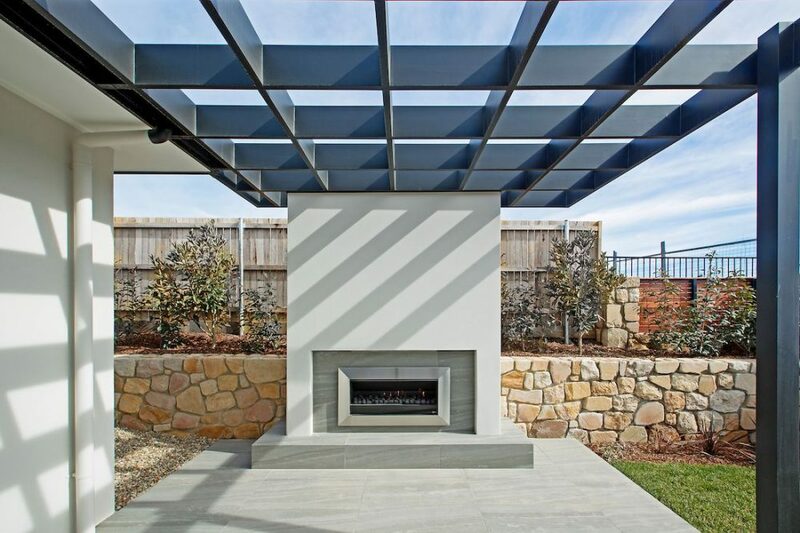 I love how the IDRIS display home by Krown Homes used it on the external wall at the entry and then carried it into the foyer to create design fluidity – they even used it on the external retaining wall around the garden bed! Metal cladding is strong, lightweight and weather resistant – essentially requiring no maintenance – which makes it a very popular choice. Available in a range of colours and profiles, such as standing seam or cassette panel, this product adds an instant architectural look to your home. 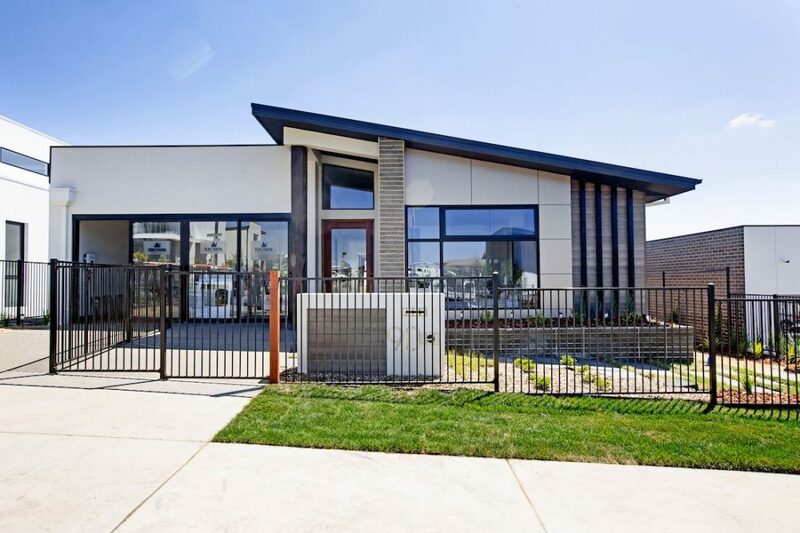 You can see how impressive metal cladding looks on the ‘Onyx’ house by Better Building in Denman Prospect (pictured below), which won House of the Year at the 2018 Master Builders ACT Building Excellence Awards. Metal cladding looks best when paired with 2-3 other external materials, such as pops of render, timber panels or brick, to soften and ground this bold material. I mentioned bricks were one of the most common building materials but there are so many types on the market now… many of which you may not have come across. A brick I’m currently obsessed with are slim or half-height bricks. Slim bricks offer an ultra-contemporary look but the high price can be hard to justify. Similar to metal screening, you don’t need to use a lot to create a big impression. Breeze blocks are also gaining popularity and many manufacturers are introducing new formats. Not only do these add pattern and interest to your home, they can also offer sound insulation, are low maintenance and have a low environmental impact. There are also more types of brick textures available now which each create a different effect – smooth face for a clean line appearance, shot-blast or sand-blast for a subtle texture, and split faced for a rough exposed texture are some more popular ones. There’s a whole world of options when it comes to bricks and blocks now so it pays to do your research. 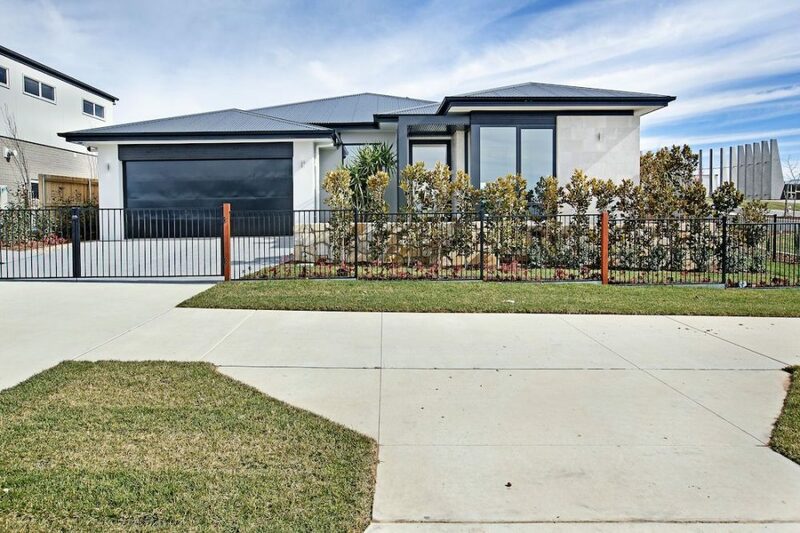 Personally, I love how the Onyx house in Denman Prospect used a column of dark grey Besser blocks, proving you don’t have to pick the most expensive brick to get the best outcome. A material that isn’t used enough, also because it’s difficult to source, is reclaimed timber. But even the smallest amount can add warmth to your home. At the Krown Homes display house, a single recycled timber pole was used at the entry as a support beam. Its beautifully aged profile tells a story and each piece of reclaimed timber is unique. Whether it’s used as a column or as wall cladding, explore the options for reclaimed timber in your area. You might just find it’s the missing piece of the puzzle to achieve the house design you’ve been dreaming of. As a dramatic wall feature at the entry or simply wrapped around garden beds, stone is a much-loved cladding option that’s available in a range of colours from sandstone to black slate. Smooth profile or rough-cut, stone adds wow factor but is also practical and cost effective. Stone requires little maintenance and has a natural resilience, particularly darker colours. As well as natural stone, there is a growing range of veneer or man-made stone available. These are generally available in a tile thickness making them easier to install. Some people like to use these on a section of their exterior and then introduce it inside, such as around a fireplace, to have a reference from outside in. Many tiles are suitable for external use, especially as a decorative feature. With thousands of tiles to choose from, you can find a tile to suit your style and some popular options include stone-look tiles, such as travertine or marble, rusted metal-look tiles and even new large panel tiles. 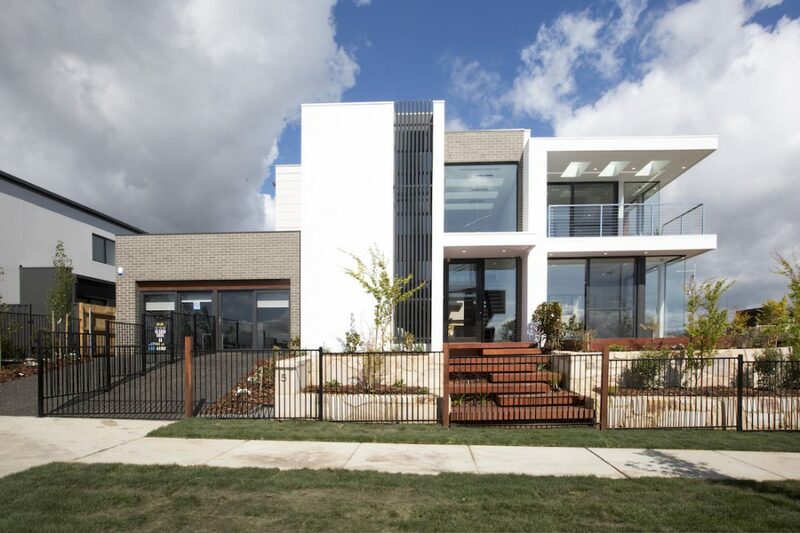 I love the restrained use of a soft grey tile on the exterior of the Rawson display home. It adds texture and interest in a way that standard render cannot. Talk about understated luxe! Finally, a great option for adding warmth and softening the hard materials often used to clad homes is timber or timber-look panels. Many people are deterred by the maintenance of timber. There’s no denying natural timber needs regular care, but aren’t the results worth it? !And there are a number of timber-look products on the market now that require little maintenance. 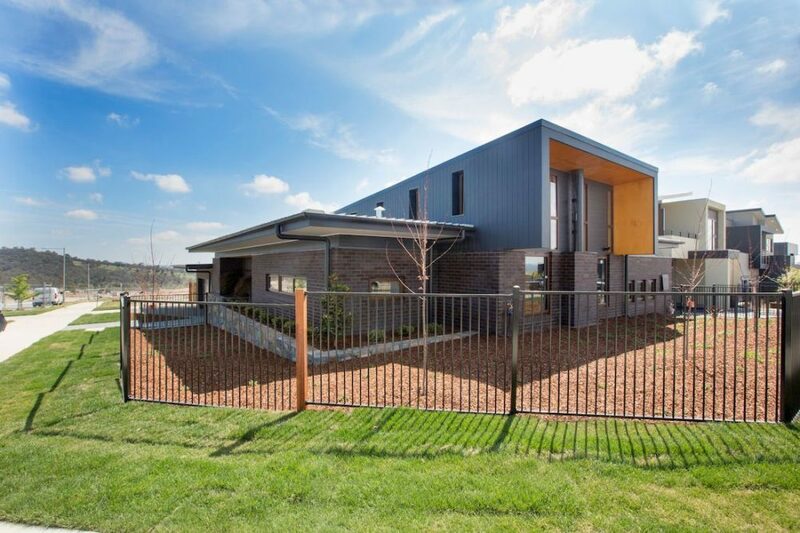 If you live in the Canberra region and are looking at building or renovating, you can tour the display village at Denman Prospect from 10am – 4pm, Thursday to Monday. There are 13 display homes from the region’s leading builders, including Classic Constructions and Kolak Living, covering every style of home from contemporary Australian to Hamptons. Previous articleAre you making one of these rug mistakes? Top designers share their rug pet peeves!